This is my fail-safe, when in doubt, easy to do, always delicious (you get the point) mid-week dinner: Mediterranean Chicken casserole. It takes about 10 minutes to put together and is a one-pot wonder. Perfect with couscous or mash, what more could you ask for? Put a non-stick pan on med-high heat and fry the thighs, in batches, skin-side down for 3-4 minutes until nicely browned. Remove and pop into a casserole dish. 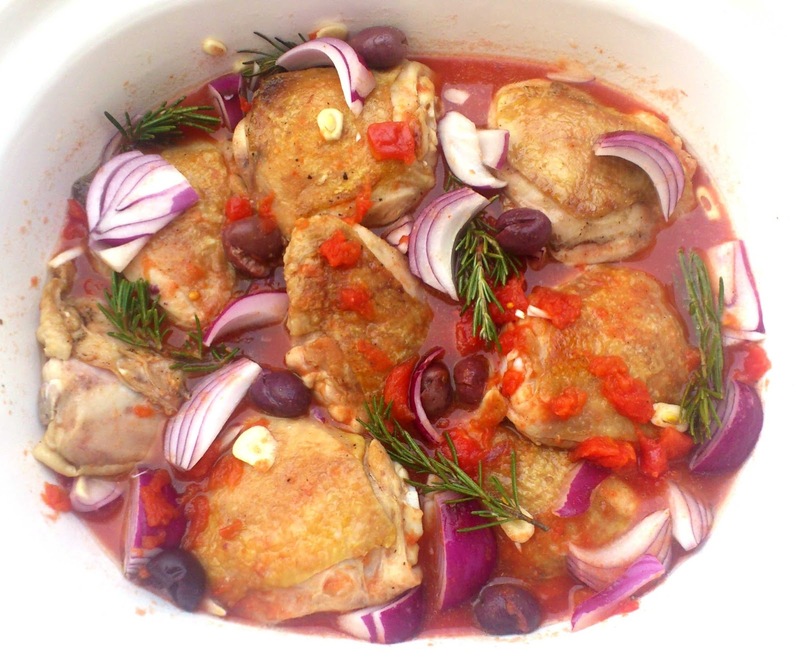 Thinly slice garlic, cut onions into 8ths and mix together with olives, tinned tomato, wine, sugar and rosemary and pour over chicken. Grind over a little of salt and pepper and cover with foil/lid. Put in the oven for 30 minutes. Uncover and bake for a further 45 minutes.